He “glanced toward the bridge and saw the chief officer place a revolver in his mouth and shoot himself. 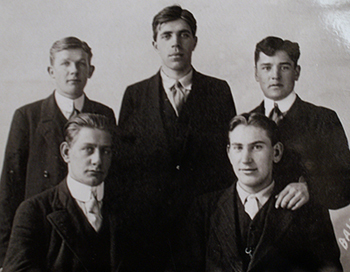 His body toppled overboard.."
In Triumph and Tragedy, he is listed as “Mr. 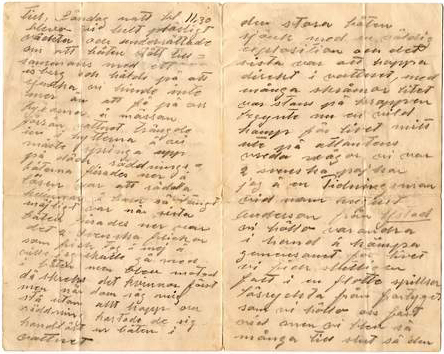 Carl Olof Jansson” (p.342 (7.)) Some sources also list him as “Jansen,” "Janson" or “Johnson”. 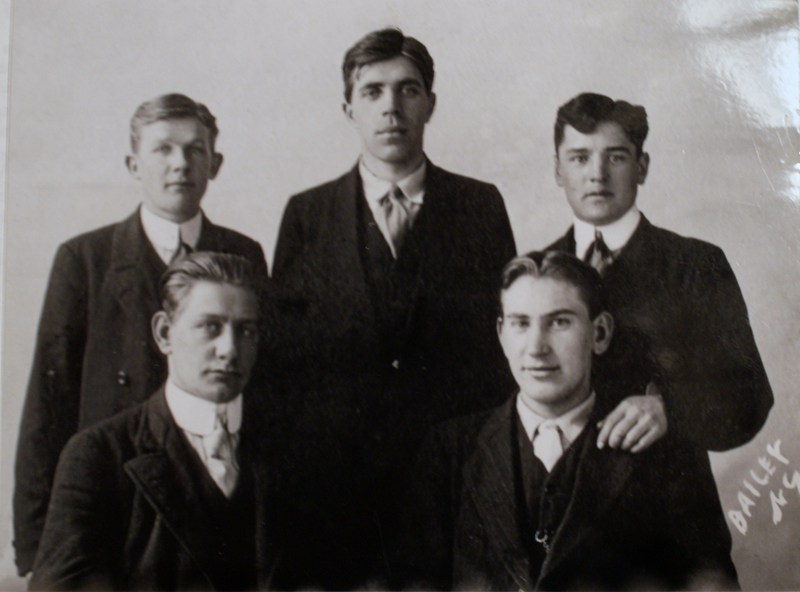 A 21 one-year-old from Orebo, Sweden, he embarked upon Titanic at Southampton, destined for Swedeburg, NE. He traveled in third class, or steerage. 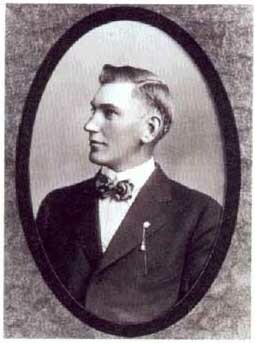 Wennerstrom, a fellow Swedish immigrant. According to his other evidence he was on board Titanic when her stern lifted high into the air and her lights suddenly flickered off. Jansson states the time that he went overboard as being when Titanic’s “nose was being buried” making the general time-frame similar to that when the wave hit the bridge and forward boat deck and collapsible A was washed overboard. However, the lights of Titanic did not flicker off until some moments after this, most historians placing it just before the ship breaks in two. However, from his evidence it is quite clear that he was in the vicinity and time-frame to witness what occurred, with many from steerage not appearing on the decks until it was too late. 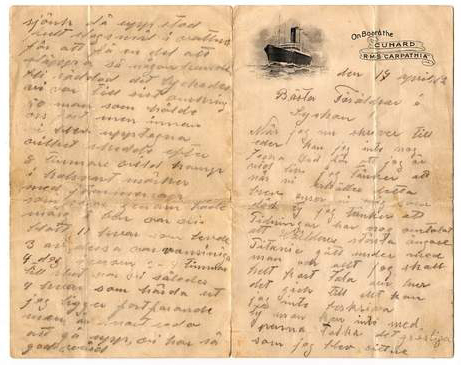 In a private email from Titanic researcher Peter Engberg-Klarström he mentions that Jansson's long letter, written in Swedish, dated 8 May, addressed from Swedeburg, Nebraska, to his brother says "the First Officer put a gun in his mouth and shot himself" -but he does not emphatically state that he saw this himself. 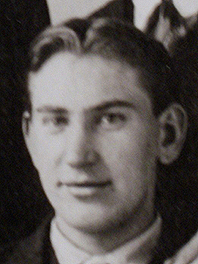 "Carl Janson... is twenty-one and a robust young man. He was a third cabin passenger and after the wreck was nearly frozen to death. 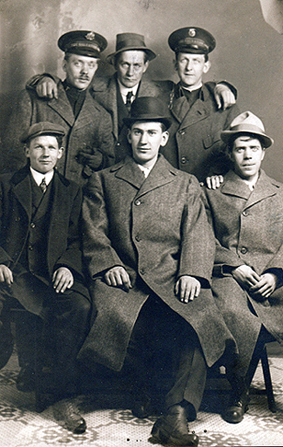 When he reached New York the White Star Line gave him a cheap suit of clothes, an overcoat and $10 in money to sign a release of the line from further damages. Janson lost $50 and all his luggage on the boat." Janson saw Chief Officer Murdock shoot himself just before the last boat was launched. He gave a graphic story of the sinking of the great liner with its human freight....Shortly before the last boat was launched I glanced toward the bridge and saw the chief officer place a revolver in his mouth and shoot himself. His body topped overboard. I waited for the last boat to leave and then jumped overboard myself. I was swimming not more than twenty feet from the ship when she upended and went down. The Titanic did not break in two, though there were two explosions. I saw her propellers as she went under. The suction was small. A door from the wreck was flung near me and I grasped it with more than twenty others. We clung to that door for hours. One by one the others slipped off and sank. On Board the Cunard B.U.S. "Carpathia"
While I now write to you I can't enough Thank God that I am alive. I think when you receive this letter you'll think I am dead. Most likely the newspapers have written that the biggest ship in the world “Titanic'' has sunk with man and all. I will tell you shortly how it happened. I can't describe it all. One can't describe with a pencil the terrible things I witnessed. Sunday night 11:30 we suddenly were informed that the boat had collided with an iceberg and was about to sink. We had only time to take on the trousers and the cap before the water came into the cabin, and we had to run up on deck. All the lifeboats were lowered and the rules and regulations were that women and children should be saved as far as possible. As the last boat was lowered, two Swedish girls wanted me to go on board with them, but I was blocked. A scream was heard: Women first! But when they saw me standing there without any hope of salvation, the girls threw themselves from the boat into the water. The big boat sank with a great explosion and the only thing to do was to jump into the water. With lots of scratches on the body I now began a struggle for life and death with the Atlantic's waves. 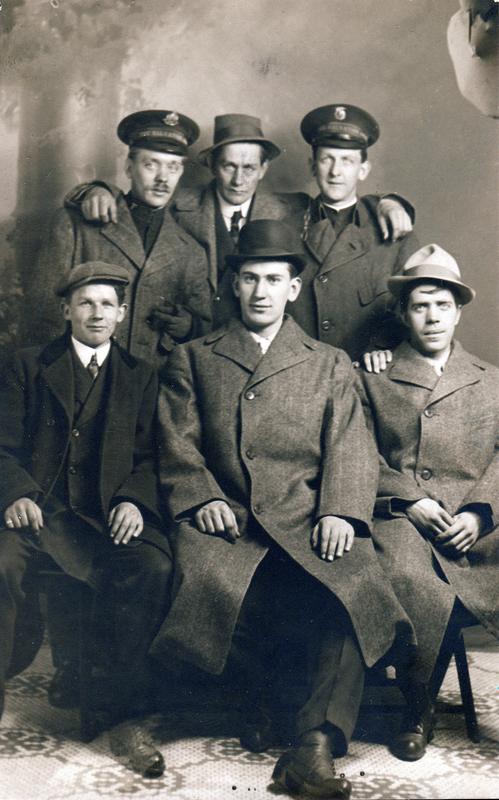 We were two Swedish boys, I myself and a journalist who's name was August Suderssou (Wennerstrom) from Ystad. We fought side by side and finally we found a raft, torn loose from the ship which we clung firmly to, but finally we were too many so it sank. Then started a tough fight in the water, making some people release their hold, so others could be saved. It worked. Finally we were 50 men clinging to the raft, but before we were saved which happened after eight hours of wild struggle in the dark with plaintive cries that pierced the very marrow of my bones. There were only 11 alive, three of us now were insane, four persons died after three to four hours. Finally only four perservered. I am still in bed, but soon I am ready to go up. We get good care, so I think it will be a happy end. It has seemed very dark, but don't worry. In that case I don't wonder. When I think of it, I can't understand how I could be saved, but my cold-bloodedness to push away the others from the raft so it could be kept on the sea level did much to it. It is awful, but in such a moment the only question is your own life. I cannot go on straining my mind anymore, and stop here with a hearty greeting to you from your through the providence of God saved son. This letter once again confirms that he was in the water at the end, but also that he is a reliable witness with no evidence of fictional exaggeration. Jansson died in 1978 aged 87.